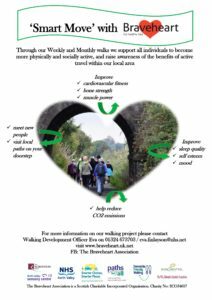 Come and join our free, low level Weekly walks encouraging everyone to become more physically and socially active within our community. We also raise awareness of the benefits of active travel within our local area. Our walks are open to everyone, of all abilities, and we support people living with long term conditions, Dementia and sensory impairments. No need to sign up, just turn up…our locally trained Walk Leaders look forward to seeing you there. We then all enjoy tea & chat in the café after our walk! Come and join our Monthly walks, similar to our Weekly walks however we venture further afield! These walks are between 2-4miles long with various options available. FREE transport is provided for many walks throughout the year, leaving Camelon Education Centre at 1pm and Carron Co-op at 1.10pm to start our walk around 1.30pm- returning for around 5pm. Due to limited spaces, BOOKING IS ESSENTIAL, please call/email from the 1st of each month to book your place. Please keep a look out in the Falkirk Herald for more information nearer the time: www.falkirkherald.co.uk. We look forward to seeing you on our various Monthly Walks of 2019, and don’t forget to come prepared for our Scottish Weather!